This CD+DVD package contains the ending song to the TV anime Inazuma Eleven Go (イナズマイレブン Go), and the ending song to the 3DS game Inazuma Eleven Go Shine. 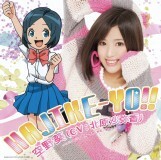 The DVD contains a promo video of "Hajike-Yo!" featuring Sayaka.